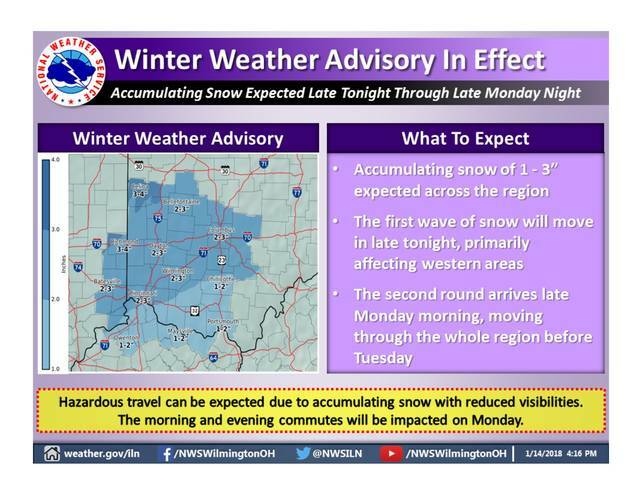 The National Weather Service has issued a Winter Weather Advisory that includes Delaware County. The Delaware County Emergency Management Agency reported that about 3.5 inches of snow fell Friday night. Tonight’s low temperature is expected to drop to 8 degrees with wind chill values around zero. Monday’s high temperature will be around 27 degrees. The low Monday night will dip to 5 degrees with wind chills as low as minus-5 degrees. Highs will be in the teens Tuesday and Wednesday, then climb into the 20s on Thursday and into the 30s on Friday. Temperatures are projected to push into the 40s and as high as 50 next weekend.